When he took part for the first time in ArtFutura in 1994 (Reina Sofía Museum, Madrid), Toshio Iwai from Japan was already one of the most important names on the international scene of media art, and maybe his projects represent better than those of any artist the new aesthetic horizon which was being set in the dilemma between technology and visual expression. Ten years later, time proves he was right. At the age of 43, Iwai is already every inch a legend which is still in force - his collabora-tions with Ryuchi Sakamoto and his installations for the ICC or the ZKM are classics of interactive art - having a decisive influence on the work of the most important interaction designers and software artists of the moment. From the great figures of digital art coming up through John Maeda's reserve in the MIT to the most daring videogame creators; they are all somehow heirs of Iwai's legacy. Iwai opened doors in the mid 90s when he was the first artist to distribute one of his pro-jects through the industry of videogames. 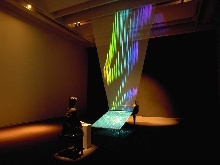 In 2005 he repeats this experiment again with Elektroplankton, a title for Nintendo DS which is equally a musical game and a work of interactive sound art. 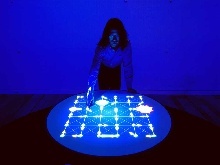 Iwai is still obsessed with the idea of relating sound and light in playful and unforeseeable ways; so obsessed that his last project is the creation of a new electronic musical instrument. 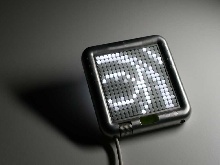 The Tenori-On is a sound panel of LEDs which is manually programmed. The LEDs switch on at the same time as they create sound. 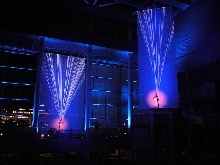 It is still a prototype, but Iwai hopes to be able to produce and distribute it commercially, so that it can be enjoyed by people who might not discover it if it were a museum piece, and develop this kind of intimate and close relationship which is difficult to establish with a standard work of art. Text originally published in ArtFutura's 2005 catalog.